When boat owners think about detailing, they’re usually considering only the visible parts of their vessel and invest time in rinsing their boat with freshwater after every trip, and waxing their hull to ensure their gelcoat remains in peak condition. While these measures preserve the beauty of your boat, your marine engine needs love, too. Attending to your outboard engine will ensure it not only looks spick and span but runs at optimum efficiency. 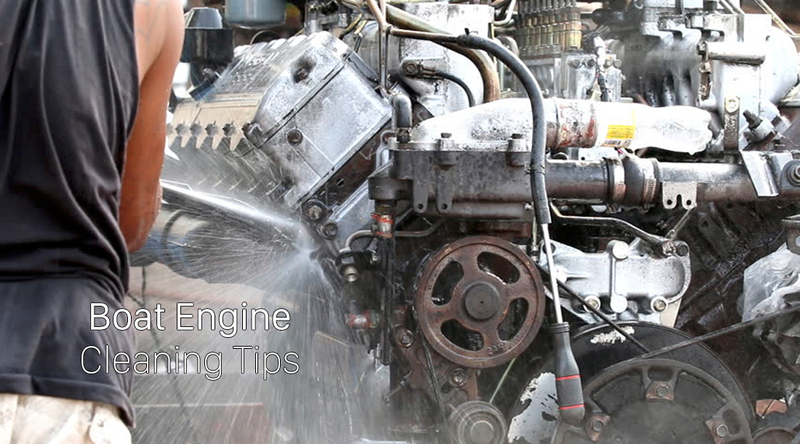 Cleaning your outboard engine shouldn’t be too daunting. Here is a simple step-by-step guide to get you started. After every saltwater or freshwater trip, make sure you rinse and flush out the engine with freshwater. This is dead simple and requires nothing more than a source of fresh water, and a set of rabbit ears to the part where the water is picked up, and a hose. Start up the engine and the pump will move the brackish water out the hose. Your engine should remain in neutral and not run above a fast idle. Make sure you keep an eye on the pumping to ensure you’re moving water not air, and so your engine doesn’t overheat. If you’re only getting a trickle, shut the engine down and check the outflow tube for clogs. If you suspect it’s blocked, try jostling the debris loose with a small piece of wire inserted into the hose. After flushing, disconnect the fuel lines and turn the engine on so it uses up all the fuel in the carburetor. Then you can switch off the batteries. Now it’s time to remove the engine cowling and inspect the engine block for defects. If you spot a fuel or water leak, you’ll have to alert your marine mechanic immediately because he’s the most qualified to diagnose and repair this particular situation. If your engine block is in good repair, go ahead and wipe it clean and follow with a dose of an anti-corrosive product like WD-40. Lubricating all moving parts will keep them working seamlessly. Finally, you can replace the cowling, and cover your outboard engine with a tarp or plastic cover whenever the boat is dry-docked. We highly recommend following your outboard manufacturers recommendations to flush each time you venture into salty, brackish, sandy, or polluted waters. If you stick to some regular maintenance, we guarantee your boat will stay in top shape and you will be on top of problems before they get out of hand.